Happy Thursday everyone and welcome to the last Fusion Challenge of March! This week we are featuring Orchid Occasions with this gorgeous aqua and pink combo! I absolutely love these colors and knew right away the papers I wanted to feature. Since it’s my last week with Fusion, the last day of March, and the end of a great company, Basic Grey, I made not one, but two cards to bid farewell to all three and go out with a bang! My first card is a tropical twist on Easter! I spent quite a bit of time on the beach Saturday as it was in the 60’s and finally sunny. Beach living is always an inspiration, so that along with the colors in the photo and Easter holiday, prompted this piece. All papers are from various Lilypad digital collections printed on Kodak matte photo paper. The base paper is a tie-dyed design, which made me think of coloring Easter eggs! The pink and rose floral paper replicates the orchid’s colors perfectly with their dark pink centers. The Spellbinders feathers, Savvy grass die, and Prima resin eggs round out my beach scene. Now for the eggs! I originally had layered three ovals; however, I realized that these should be eggs, but I didn’t have egg dies big enough! What to do? I am sure someone, somewhere has thought of this, but it was an a-ha moment for me! Your oval die cuts can easily be made into egg shapes of any size by using a circle die to cut the bottom. Then you just need to round off the corners with a little fussy cutting and voila, egg! To give the eggs a little more depth, I adhered three layers and popped up the Happy Easter one with foam squares. As many of you know, Basic Grey has ceased their paper crafting portion of the business and is focusing on fabric and digital prints. I was shocked to learn of this in January and am sad to see them move away from paper design because collections like Urban Luxe, one of the last released, Persimmon and Spice Market to name a few, really speak to me. Trendy, funky, and just plain beautiful, most of their collections were a must-have and entirely horde-worthy in my book! So for the next card, I incorporated some embellishments from the Urban Luxe collection. Many of the papers in Urban Luxe would have worked with the inspiration photo, but I opted to stick with the Lilypad papers. I incorporated the sketch loosely in my card as well. If you look closely in the photo above, you can see how the flamingo bodies flow almost seamlessly into the pink floral lines of the underlying paper! The gorgeous grey leaf, watercolor flower, and watercolor love sentiment are all from the embellishment pack. I love how they look against the aqua flamingos! If you look closely, you can see the watercoloring on the black/white paper; it has blue washes throughout the print that are lovely. 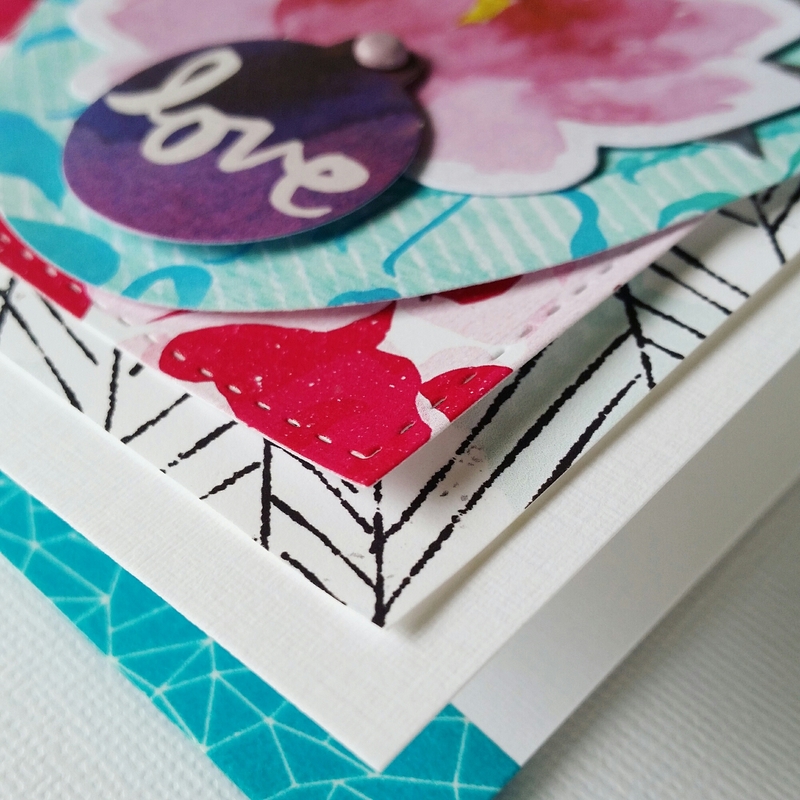 The inside is finished off with some geometric washi that echoes the lines on the papers. That’s all for me! Hope this double dose of inspiration and the rest of the Fusion team spark your creativity! Thanks so much to Fusion for having me this month! It’s been an honor to be part of the team! 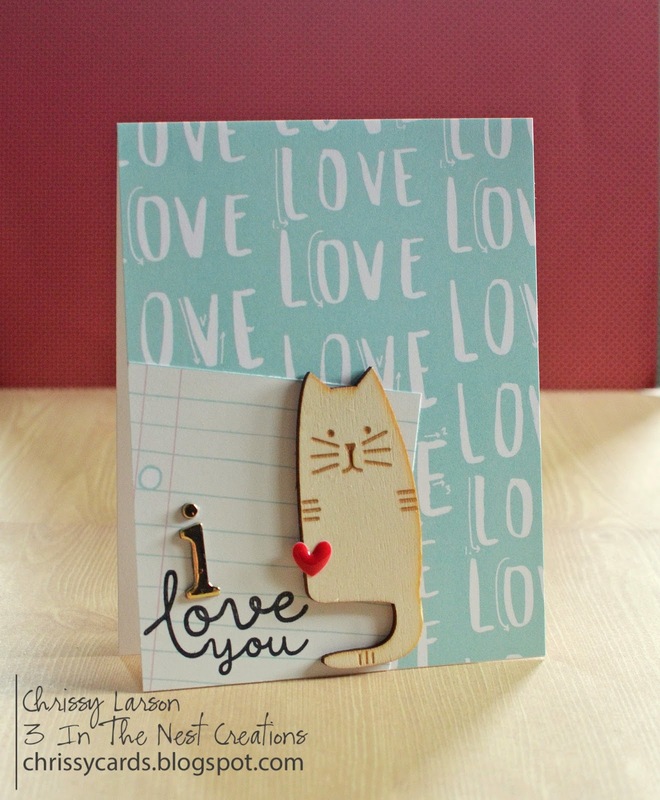 Happy Saturday everyone and welcome to Lesley Croghan’s new design and challenge feature, Inspired by All the Little Things. 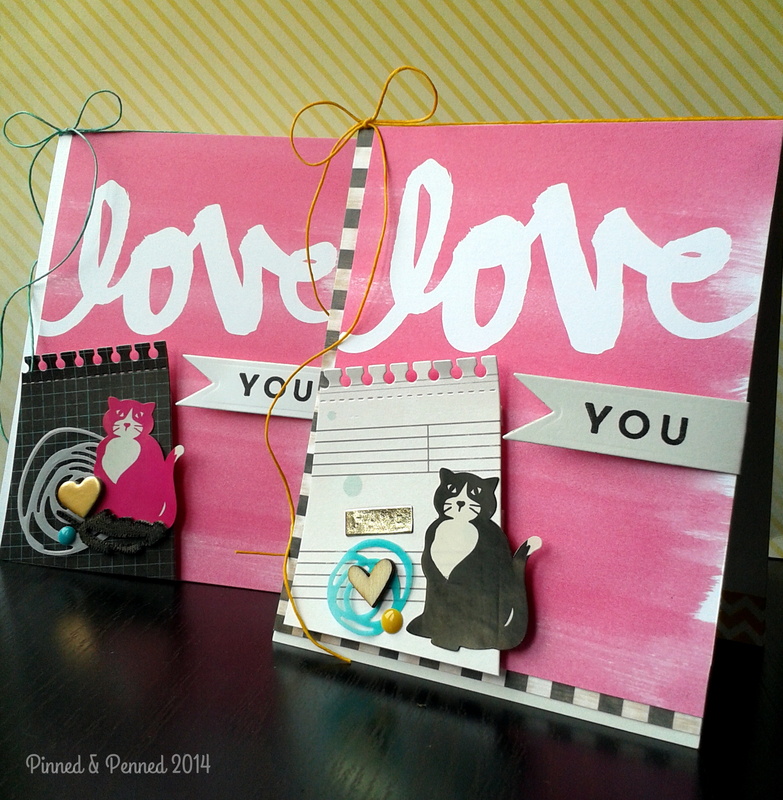 One of my favorite card makers, the prolific Jeanne Jachna, asked me to be the featured designer this week and how could I resist? 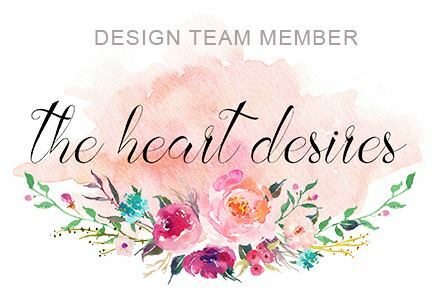 I’ve been following Jeanne for nearly two years now and adore the work she does for numerous product design teams, especially Pretty Little Studio. Thrilled was I to receive one of her gorgeous creations out of the blue this fall–a RAK at the perfect time, which I wrote about here. 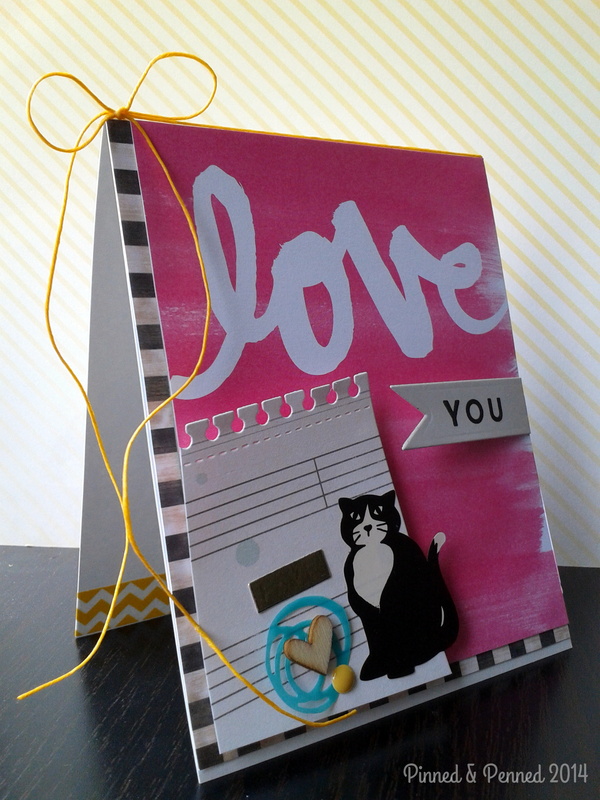 Her cards are so well constructed, and incorporate a variety of elements that are always perfectly executed. She is a master at mixing and matching patterns without her work ever looking too busy or cluttered– quite a feat! Jeanne’s cards always inspired me– and if I ever get around to posting the images, you will see some holiday pieces that were created with her in mind! Now onto today’s feature, which actually isn’t a card, but rather a layered, collage-style piece that I plan to put in a shadow-box frame as a gift. I was given this inspiration image to work with. Now there’s a funny little story behind this image because Jeanne happened to send the photo to me many, many times as a result of a technological glitch. And I looked at it just as many times, if not more. Despite that, for some reason I had impressed purple and yellow as the dominant color theme in my mind when designing my work– and that is a tough combo for me, as I rarely use purple in any of my work. After completing my piece, I looked back at the photo and saw the flowers anew. Clearly they are a cornflower blue! What is even funnier, after explaining this to Jeanne, she said she made her card with blue flowers, but when she reviewed the photo, thought they were purple! Anyway, lots to take away from the photo, and while I didn’t want to create something that would be such a literal interpretation of the image, that is what transpired to a large extent at least with this finished piece! Gorgeous, no? Now these are some purples I can work with! 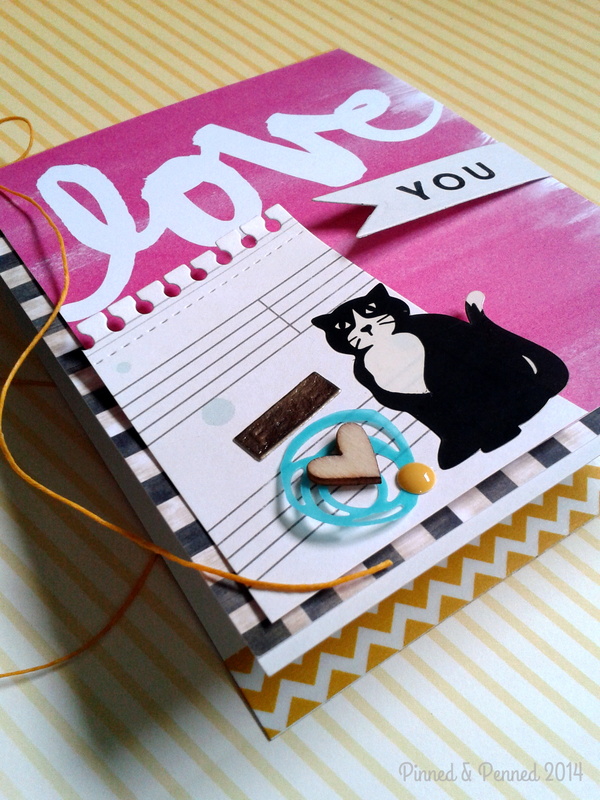 The hooray die cut is from Studio Calico; love this imperfect oval and delicate, thin font. I was trying to figure out where to place a sentiment, and had this die cut prepped for some other variations, so gave it a try. I really like the layer and the lines it creates against the leaves and flowers; it’s kind of like a bowl under the popped out flower. And speaking of leaves and flowers, the purple Hawaiian type flower, the 3-D daisy, and green-yellow large leaves are all from Wild Garden by Julie Ebersole. This is really a must-have set if you love florals. 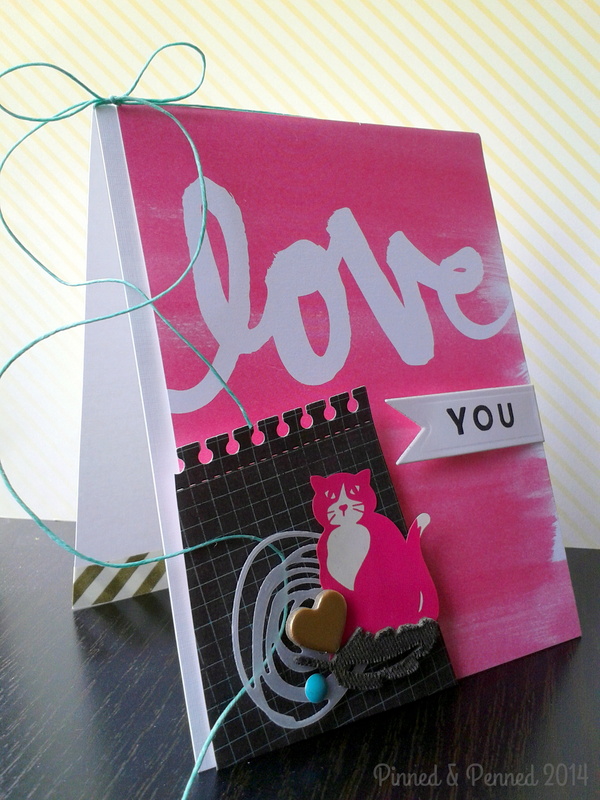 I totally love the die cuts Julie has been designing in conjunction with Ellen Hutson. The striped vine is from my other favorite floral set by Maggie Holmes, and the long vellum Cottage Leaf die is from Memory Box. To echo the peeling paint background of the inspiration photo, I die cut a strip of peeling paint paper to layer under and ground my centerpiece. Love the colorful, collage-style paper which I used as my base layer; if you can see it, there is a little burlap texture at the top of the design which contributes to the shabby feeling. Finally, the bird die cut, which echoes the cut-out bird on the inspiration photo is from Kaisercraft, and the wreath is from a great Spellbinders set I stumbled upon recently. The left corner seemed a bit empty, so I added my clip to echo the clothespins on the line. The entire piece is about 5×5 and will be framed in an 8×8 shadow box. Well, now it’s your turn to play along with us! I hope you have been inspired by the photo and our interpretations! Thanks to Leslie, Jeanne, and the rest of the team for having me! I look forward to seeing what you create and learning how you are inspired by all the little things in life! We hope you will play along with us! I am feeling a bit dispirited to say the least as I begin this post, anew. After hours of writing, uploading, copying and pasting, and linking, I lost my nearly ready-to-publish draft. I had decided to use the “improved posting experience” via WordPress and I won’t bore you with the details, but suffice to say the layout of the new page, and lack of automatic saving do not make it an improved experience whatsoever. I feel like the bottom of my stomach just dropped out of me! I sure hope you had a better end to your celebration of World Card Making Day! 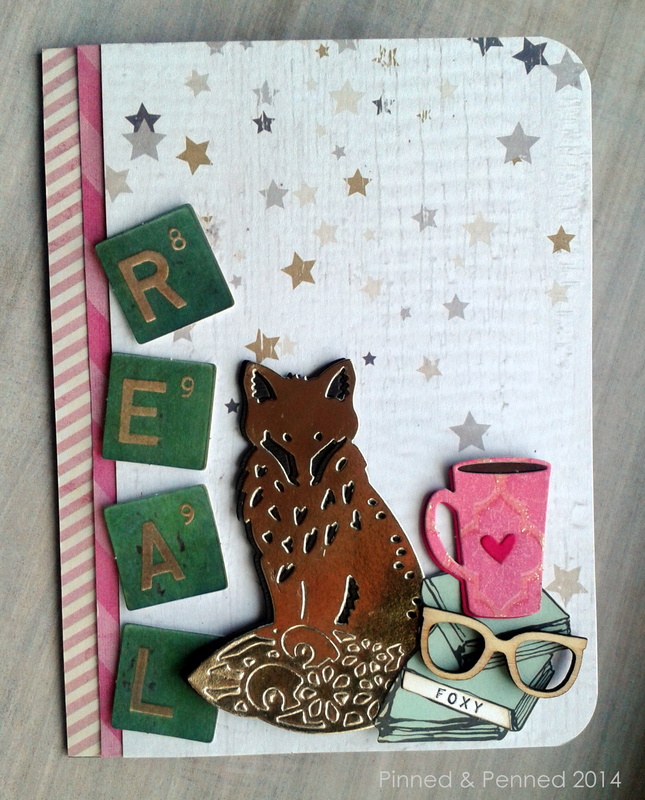 I had hoped to make some coffee cards with the Prima Coffee Break collection for the Coffee Lovers Blog Hop last week, but with our trip to the Olympic Peninsula, I didn’t have the time. So after a busy return to work, I was excited to finally dig into the collection, use some new dies, and work out a few ideas this weekend. I am happy to say I completed at least one card for WCMD, along with photographs and editing. As I write this, I am trying to forget that I also would have had a post completed before the day was done… curses, WordPress, curses! Anyway, here’s my foxy little number. After looking through the ephemera pack, I will definitely be purchasing a few more as it is loaded with some really good pieces. Sometimes I wish you could tailor the bits that come in the packs, or buy them in bulk. 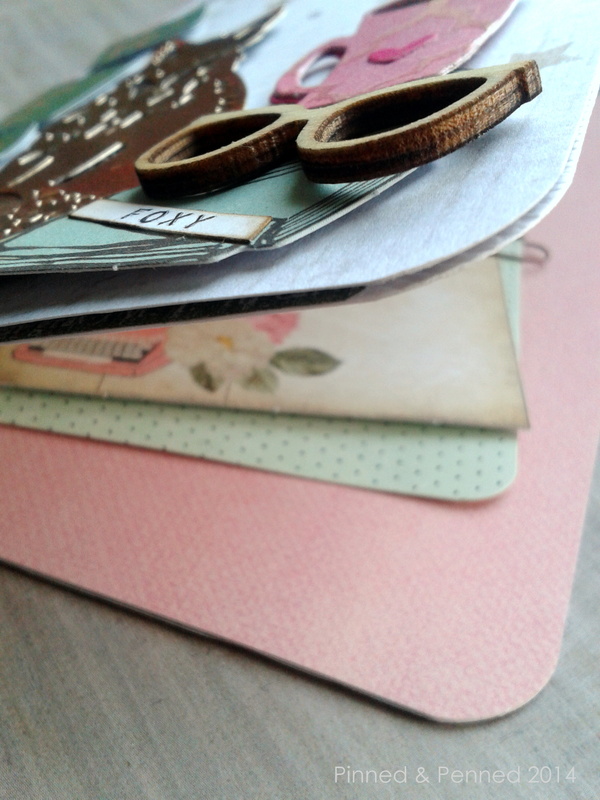 Like the stack of mint books or Scrabble pieces featured on my card! The Scrabble pieces also included an “x” so that you could spell ‘relax’; however, I had other wily ideas! Is anyone else frustrated when you purchase an ephemera pack and there’s a bit included that you want 20 more of? I created the “foxy” sentiment on my computer, hand-cut, and distressed with Antique Linen and Walnut Stain, then adhered to the book’s spine. The glasses were turned over so they created more of a contrast; they are a rich walnut color on the other side. 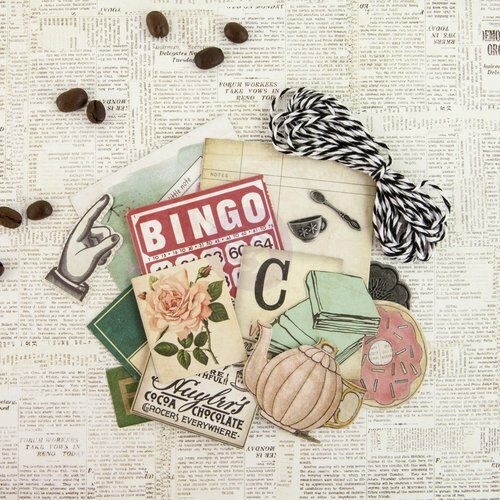 The mug is cut from Heidi Swapp Sugar Chic paper using that fabulous Impression Obsession Coffee Set I featured in my Coffee Lovers Blog Hop post. The “coffee” inside the mug was cut from paper distressed with Walnut Stain ink which makes such a rich coffee color. And what about that fox? I saw him a few weeks ago and knew I had to add him to my repertoire. I love the design of his tail. 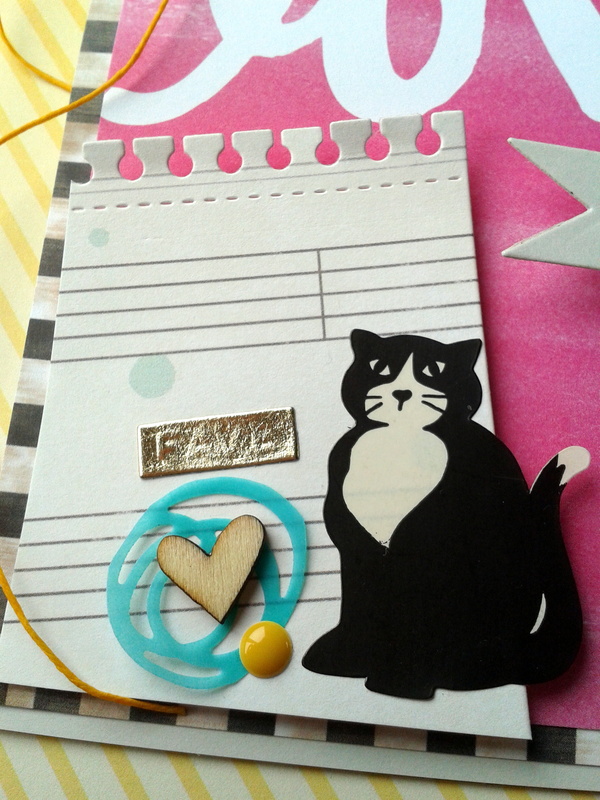 For this card, I cut him from Chickaniddy Goldie Lox foil (or “Goldie fox” in my case!) and created a shadow layer with some black-brown textured paper from Bazzill. My patterned papers, including Teresa Collins Tinsel and Company stars, have been adhered to Ellen Hutson heavy-weight wood-grain and finished off with some signature washi on the back, echoing the greens on the front and inside the card. I layered some of the Heidi Swapp paper as a base, and embellished the edge with a cardstock sticker that was a freebie from Emma’s Paperie. I love shopping with them because they always send you some additional materials, and once I received a little card making pack complete with an envelope! Love supporting them! 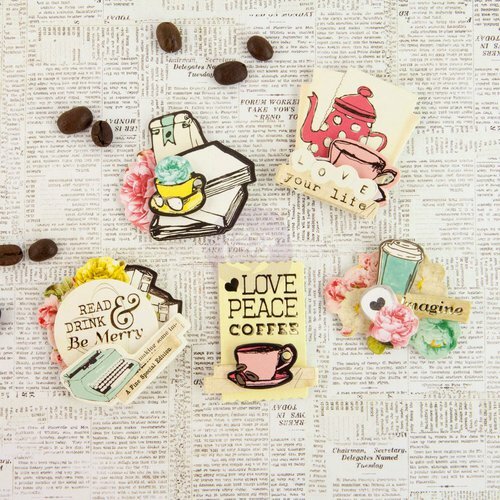 The mint green dotted paper has been repurposed from the packaging of the 3-D stickers in the Coffee Break collection. 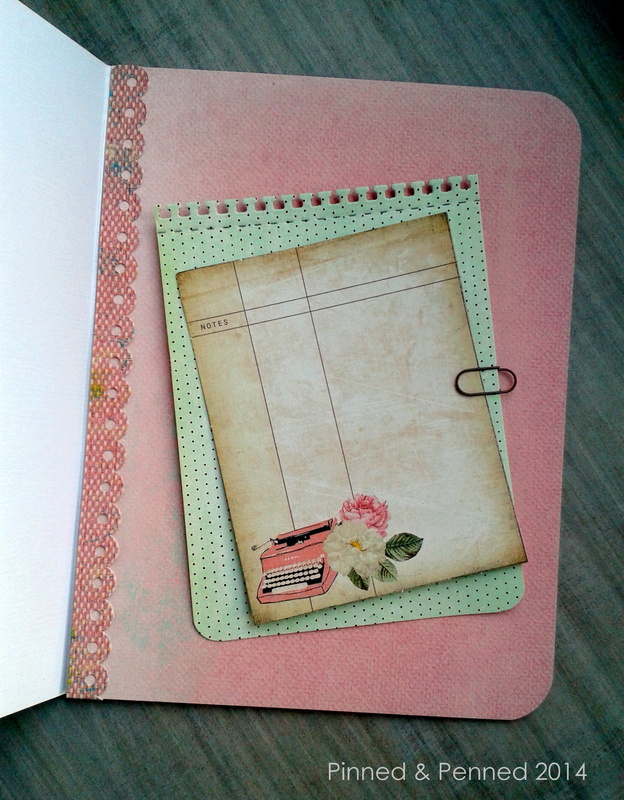 I cut to my desired size, die cut the stitching and notebook edge with Paper Smooches Stitched and Borders 2 dies. Both of these are dies I reach for over and over. 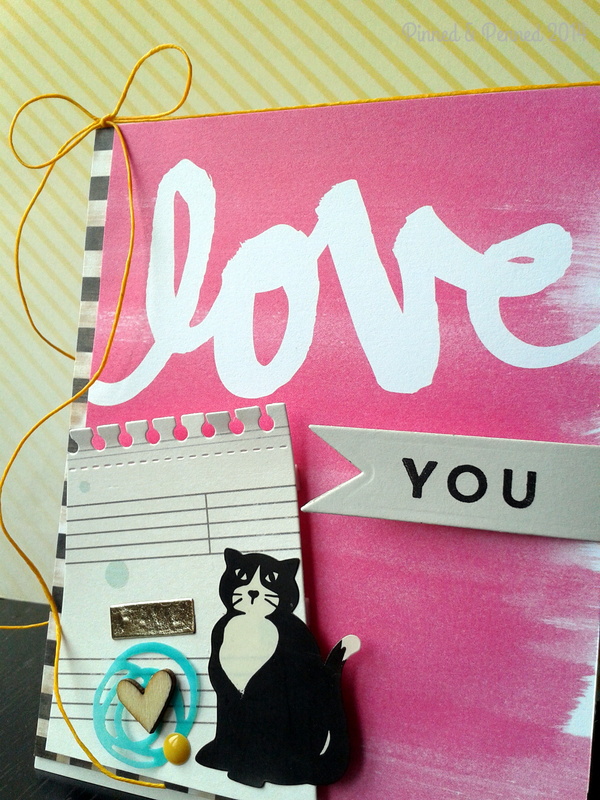 The little notecard is from the ephemera pack and has been adhered with a tiny Tim Holtz paper clip. 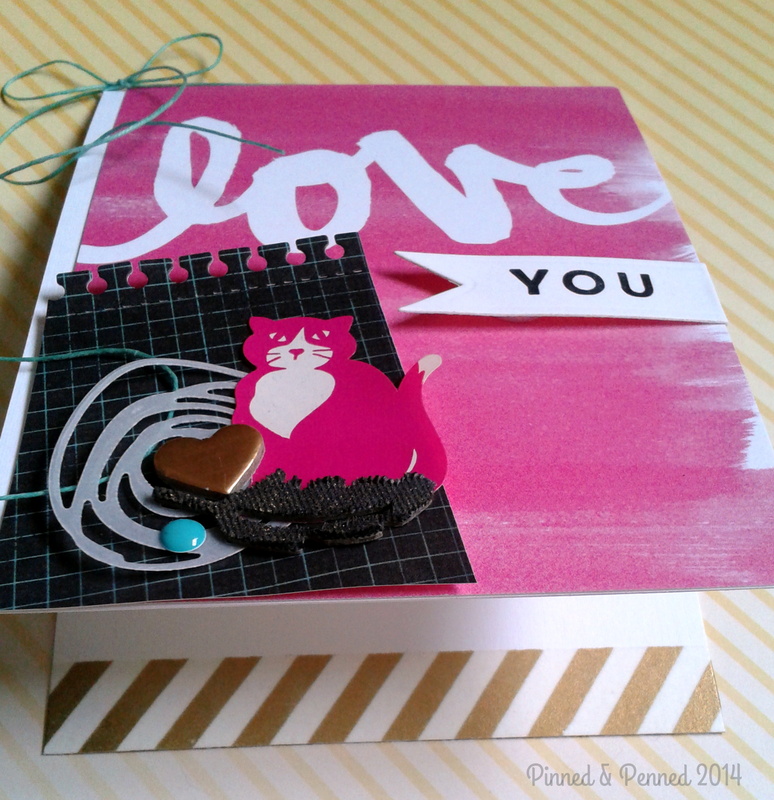 Unity Stamps has this great Stamp of the Week and I want to use the sentiment for the inside! I just joined their stamp of the week subscription as I love their offerings and cheeky sentiments. In order to purchase the old stamps in their collection, you have to be a current subscriber. 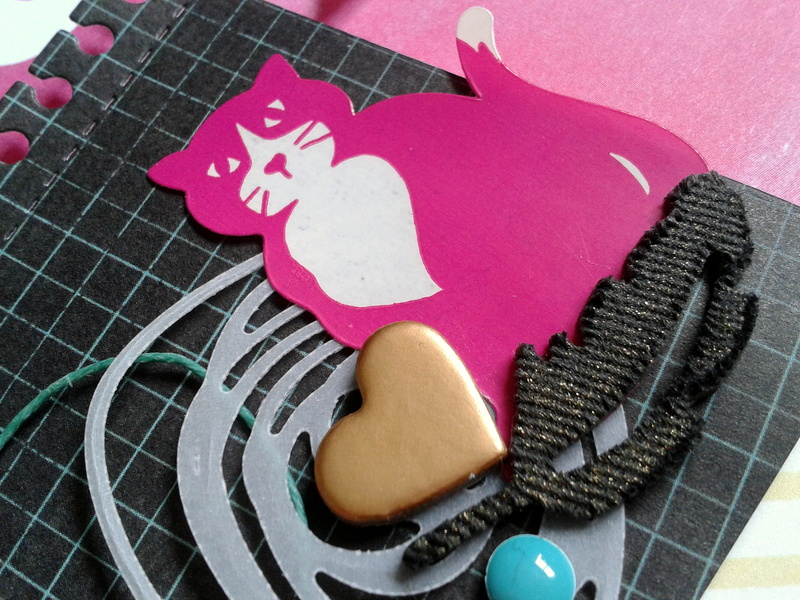 Do you ever repurpose packaging into your cards or paper art? You can see another repurposed piece here. As I mentioned in my previous post, I am not so good with space or time. 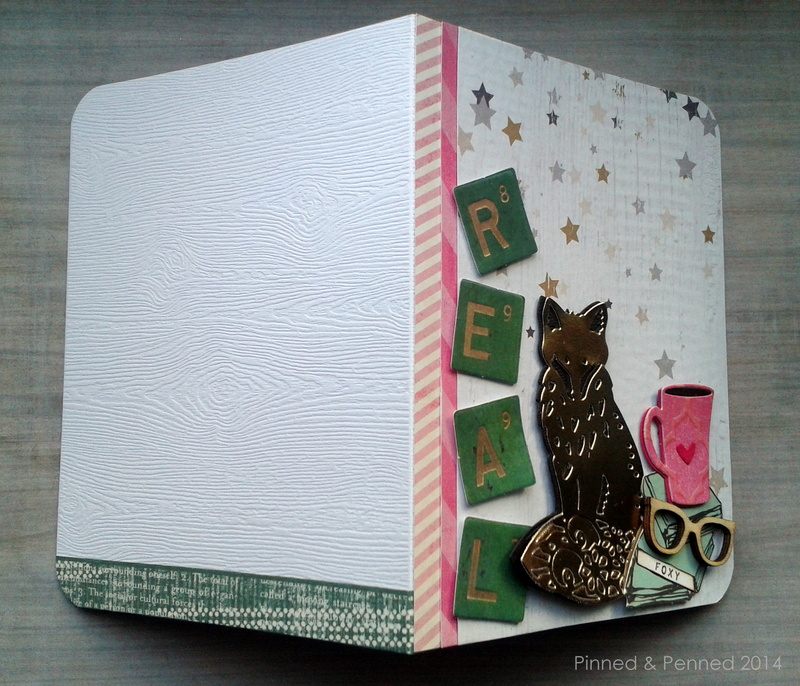 Unless I am creating a stamped piece, I rarely know how big a card is going to be before I start making it; rather, I begin with my concept and focal point, and then however big the card needs to be, it is! In this case, my card turned out to be 4 3/4 x 6 1/4. I was trying to work my embellishments within the flow of the stars, so I found I needed a wider space. Didn’t exactly follow the plan step of my 3 P’s on this one! TIP: I spent a lot of time moving the pieces around– but with the use of my favorite 3M Restickable squares, I can easily reposition pieces multiple times without tearing the paper. 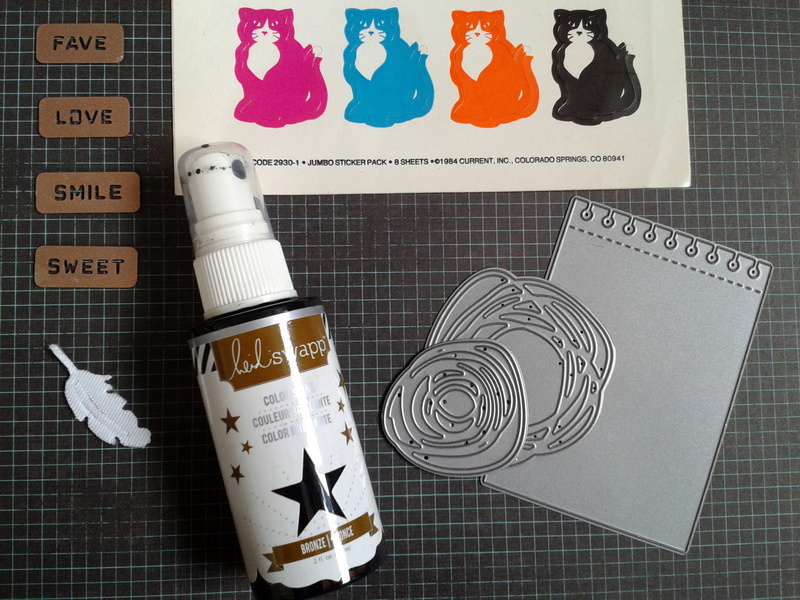 This adhesive is really indispensable if you are doing a lot of layering. 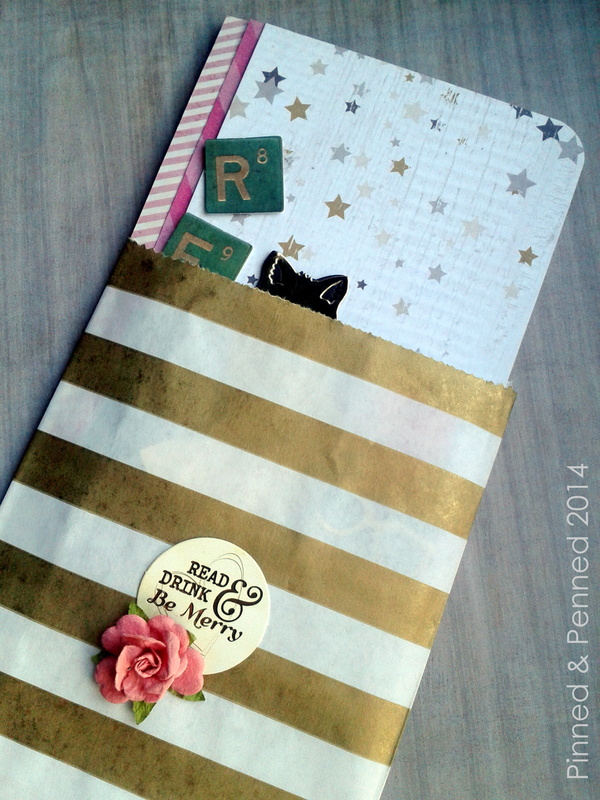 Since I didn’t know the finished size of my card until I was, well, nearly finished, it came as a delightful surprise when I pulled out a Whisker Graphics gold striped bag and the card fit perfectly inside! So I decided to embellish the outside of the bag a bit. 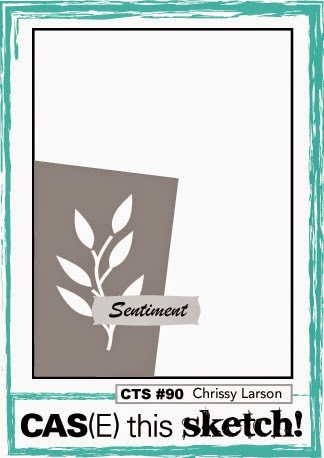 The sentiment is a deconstructed 3-D sticker from the Coffee Break collection; I really like how you can stretch these stickers. They can all be taken apart and used as single-layer pieces. The flower is also from Prima. 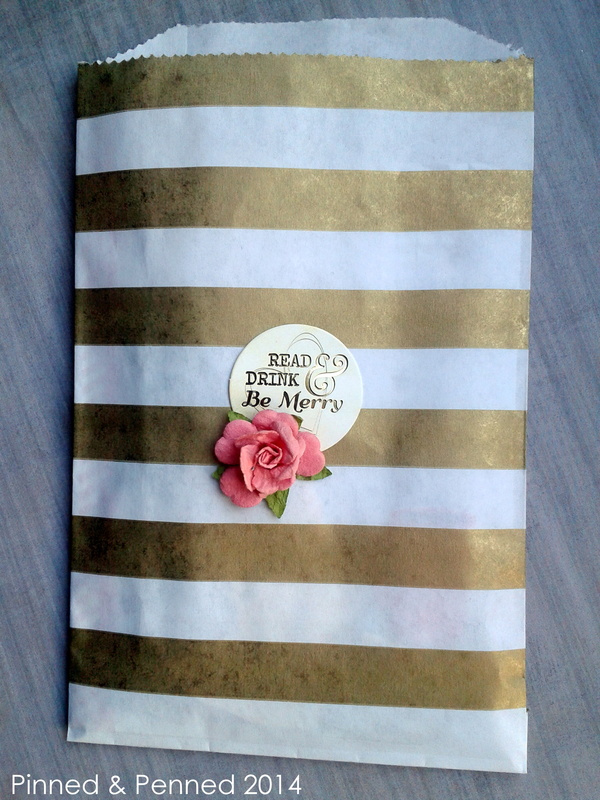 I think this little package would be the perfect gift along with a bookstore gift certificate and coffee card for any coffee-drinking book lover, don’t you? 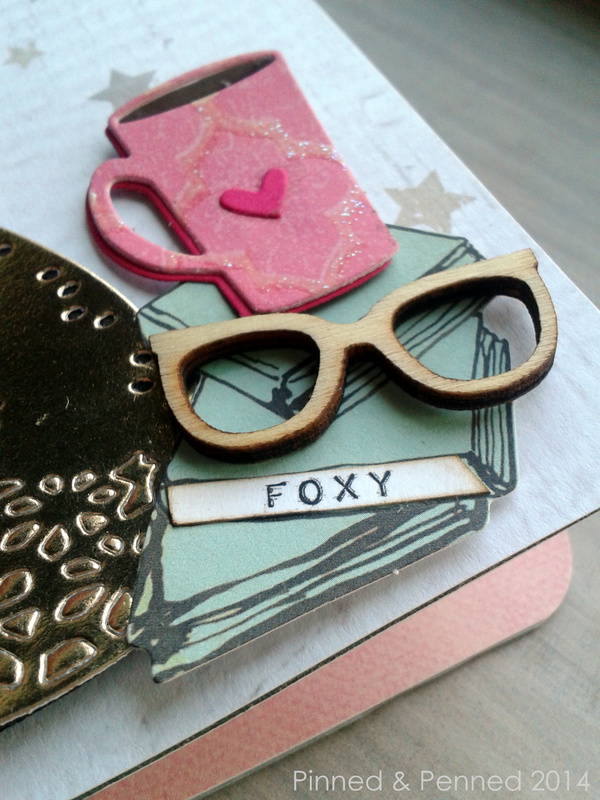 Maybe your favorite foxy librarian? 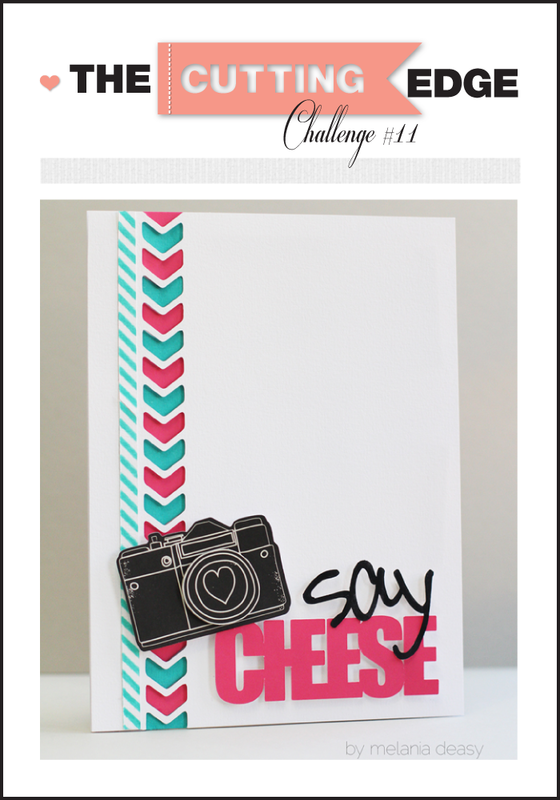 I have been wanting to participate in the Cutting Edge Challenge for a few months now, so I am going to submit this to their current challenge. The design team is fabulous and the current inspiration piece is great! Speaking of foxy librarians, check out this tune by My Morning Jacket. It’s a perfect accompaniment for my card, and an absolutely gorgeous song with compelling lyrics. I can hear the insects buzz on the leaves, ‘neath my feet. To the hall of books. When God gave us mirrors he had no idea. There I spy you listening to the AM radio. Another lovely victim of the mirror’s evil way. May you find yourself today with a song in your heart, a book in your hand, and a cup of coffee to warm your soul! Thanks for stopping by!